On the east side of the street is the Woolworth Building at 135-141 South Orange Avenue. Constructed in 1924, the building was built for $100,000 by Franklin J. Mason and was opened in July 1924. The building was occupied by the Woolworth Store from 1924 until 1989, and then by Terror on Church Street, a Haunted House attraction, in the 1990s. This block, which includes the McCrory's Store, was demolished in January 2004. The Woolworth Store replaced the Guernsey Hardware building at 135-141 South Orange, which was constructed circa 1881 and demolished in 1924. Guernsey Hardware as originally the Cassius A. Boone Hardware Store. Boone operated his hardware store along with his partner, William A. Patrick. In 1895, the building and the stock was purchased by Joseph L. Guernsey. Boone chose to go into the citrus industry instead of running a store. Guernsey Hardware operated in the store until 1922. Original 5.5 x 3.5 inch color postcard by Genuine Curteich-Chicago, 1951: Orange News Company, Orlando, Florida: Private Collection of Thomas Cook. We live at the end of this street we go up this way everyday. Rec'd your post card. Mrs. Trondle[?] told us she expected to come to Fla. Xmas day here was as hot as the 4th of July. No one wore coats while you folks are freezing. Heard you have [?] Mrs. Srager[?] expects to come soon. I wish you would come too. This is a lovely spot. Write and tell me the news. Genuine Curteich-Chicago. 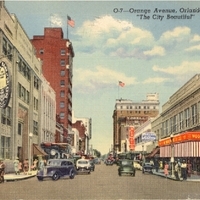 “Orange Avenue Postcard.” RICHES of Central Florida accessed April 22, 2019, https://richesmi.cah.ucf.edu/omeka/items/show/1004.